Sink into the atmosphere of the First Republic. The time of gallant lords and elegant ladies, thriving entrepreneurs and rich cultural achievements. At the turn of the 19th and 20th centuries many important buildings were built with elements of baroque and sequential Art Nouveau style. Originally only the Art Nouveau café and restaurant called Heinrichshof, whose façade adorns the year 1899, were built in place of the little houses by hotelier Heinrich Hohl from Nový Jičín. 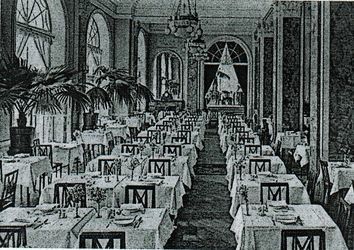 In 1907 it was extended with the neologian modernism served as a hotel according to the project of the well-known Viennese builders Hubert and Franz Gessner. The interiors have undergone many changes since then. The result was a total loss of the original grace. During the World War II several officers and soldiers stayed there. It is said that the original old crystal chandeliers that decorated the hotel were shot to pieces by one of the Russian officers. They were known for their violent behaviour at that time. 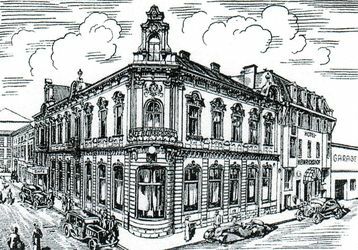 After the war the hotel was run by the Hotel school Frenštát pod Radhoštěm, which provided practice to its gifted pupils and trainees. They could test all parts of the hotel services under supervision of their instructors. Hotel Praha has been owned by various owners who unfortunately did not manage to restore the spirit of the hotel. We intend to record the year 2015, when we reopened the hotel, as the beginning of the comeback in history of today’s Hotel Praha. Back to the glory of the Viennese café, the hotel activities, the music programs and the debating evenings.